With some reluctance, I’m going to promote a TV thing on this space. On July 4, I’m going to try to do something that I’ve never done before. Some fool has probably tried it elsewhere, though I don’t know of it. Somehow, WXIA snagged the rights to the live coverage of the 2011 AJC Peachtree Road Race (we’ve been admonished to use its full name, or “the Peachtree.” As rights-holders, you buy into this sort of thing). When the 10K starts at 7:30am, reporter Julie Wolfe will run the race, wired with a mic and IFB for live coverage. 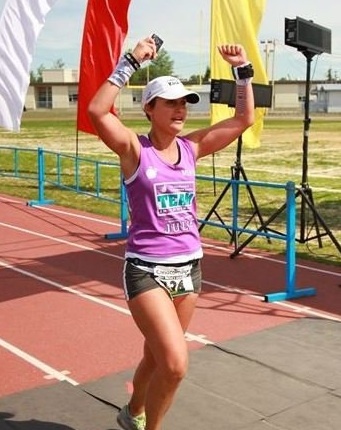 Wolfe ran the Alaska Marathon a couple of weeks ago. The woman can assuredly run a 10K and talk and interview runners and God knows what else, simultaneously. She’ll have a small team of folks with her, including yours truly. We’ll be schlepping gear. Aside from a TV camera, the essential piece will be a 20 pound backpack. 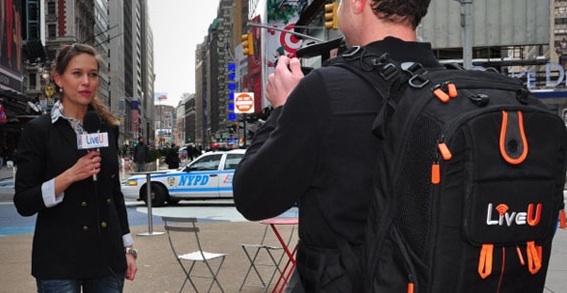 As I understand it, the backpack contains musltiple cell-phone transmitters. They all fire up and create a super-signal, creating the capability to produce a decent TV picture. It’s many steps above the stop-action imagery of Skype, but a hair below the quality of a microwave or satellite or hard-wired live shot. The fun part will be running the 10K while carrying the 20 lb. backpack. That’s my job (though I expect to lean heavily on my friend Bo, who will run with us and has agreed to help schlep gear. Team Wolfe will also include a WXIA / UGA intern named Kala). I’m reluctant to promote this because of what could go wrong. Three things come to mind: Bad weather, technical failure and human failure. Plus, it’ll be over in a week, one way or another. If you’re running the Peachtree or watching WXIA’s live coverage, feel free to heckle me. I’ll be the sweaty, wheezing, slow-moving guy running with a backpack, trying to keep pace with the TV-ready mic-toting woman half my age. One last thing: I volunteered for this. This entry was posted in WXIA on June 27, 2011 by live apt fire. Earlier this year, members of WAGA’s I-Team made a video for a non-profit organization to be played at a banquet. The video was a public service project. The I-Team’s editor burned the video onto a DVD using a new DVD burner. When they took the DVD to the banquet early, the house machine couldn’t play the DVD. It was the first time they’d tried to play a DVD from that burner on another machine. It turned out that DVD hadn’t been finalized, and the machine offered no prompt to do so after burning the DVD. They fixed the problem in time for the banquet. But then the editor had a moment of horror: He’d used the same DVD burner to create the I-Team’s submissions for the 2011 Emmy Awards. When the nominations came out in May, WAGA’s I-Team didn’t receive a single nomination. It was a historic aberration. WAGA’s investigative unit doesn’t win every year, but it always gets multiple nominations. 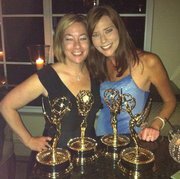 The Southeastern chapter of NATAS awarded its Emmys Saturday. It was a great night for investigative reporting, whatever the reason for WAGA’s absence. Click here for a complete list of nominees and winners. 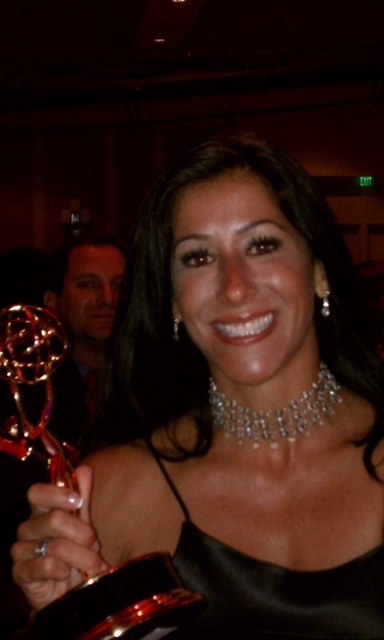 At WSB, Jodie Fleischer won four Emmys for investigative stories she’d produced. WGCL’s Wendy Saltzman won one. 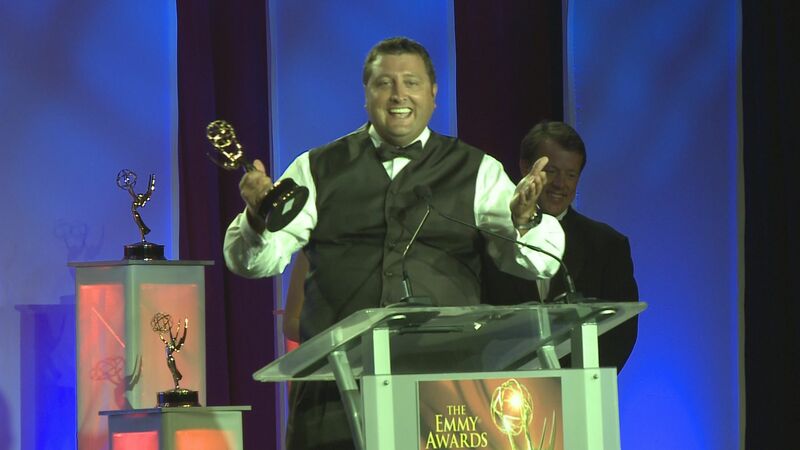 Ross McLaughlin and Shawn Hoder, WXIA’s Center for Investigative Action, also won one. Hoder’s acceptance speech, along with Sonny Dixon’s and Harry Samler’s, was among the most amusing of the evening. If a slew of awards helps jolt investigative reporting across Atlanta’s media landscape, then WAGA’s absence Saturday can only help the cause. Although its slide has abated somewhat, the old traditional news media is still on the ropes as a commercially viable institution. Investigative reporting tends to fill less time and newsprint space, draining resources from day-to-day operations. Too often, consumers of news view investigative reporting — as they do the rest of the news media — with suspicion, as news organizations occasionally overplay their narratives or overpromote their stories. It would be easy for news organizations to give up on time-consuming, long-form investigative reporting. It is under such circumstances that scoundrels thrive. When a once-burly news organization like the AJC shrinks and reshapes itself, it has fewer journalistic eyeballs to spot scammers and self-dealing politicians. Likewise, when state government decides to gut the state Ethics Commission budgetarily — and voters decline to howl in protest — politicians can talk about “transparency in government” while in fact, operating in greater secrecy. So cheers to the Atlanta TV news investigators who swiped some attention from WAGA’s I-Team Saturday. Their efforts were legitimately award-worthy, and their managers need to give them a long leash to continue to look under Georgia’s many rocks and inside other dark places. Hopefully, the new regime at WAGA will resist any budgetary temptation it may have to misuse or reassign Atlanta TV’s strongest investigative reporting unit. No doubt, the I-Team will figure out how to use its DVD burner next year. Maybe that technological hiccup was actually a good thing for anybody who wants to see scoundrels kept in check. This entry was posted in WAGA, WGCL, WSB, WXIA on June 20, 2011 by live apt fire. Chewing through a cheeseburger at Grindhouse, I beheld for the umpteen zillionth time the mechanical gorilla that greets motorists next door at the Two-Minute Car Wash, and I had an epiphany of sorts. That guy and I have a lot in common. Here are five things. The blank expression. The gorilla consistently wears the same freakish, semi-astonished, semi-crazed look on a daily basis. TV reporters frequently wear the same look, betraying very little real emotion. We are allowed some emotional license. We can project outrage or empathy when appropriate. Sometimes we fake some satisfaction or humor. But mostly, we look like the gorilla. The mechanical movements. Our similarities become especially evident when TV reporters are asked to perform during live shots or standups. For further elaboration, see the video below. The wear and tear. The more seniority I achieve, the whiter my hair gets. The longer the gorilla stands out in the sun alongside Piedmont Road, the greener his hair gets. The manager at the Two-Minute Car Wash says he spray paints the gorilla’s hair black periodically. TV reporters have similar cosmetic weapons in their arsenal. The public persona. The Two Minute Car Wash gorilla is a consistent performer on the public stage, in a high-traffic area of Midtown Atlanta. The TV reporter is also a public-stage performer with a measure of daily consistency. The difference: The gorilla is a beloved Atlanta institution. Most of us aren’t. The disposability. The Two Minute Car Wash has had a mechanical gorilla on the curb for over 25 years. The gorillas wear out. New gorillas are acquired to replace the old ones. Most customers never notice. One day, WXIA will replace me. The viewers will never notice. This entry was posted in WXIA on June 15, 2011 by live apt fire. Perhaps you’ve noticed an absence of activity on this site of late. I need a vacation. As I’m immersed in the minutiae of newsgathering , I’m less amused by the foibles I’d normally use as fodder for this site. The recent “dumb luck” post was a good example of what’s not particularly interesting about my job. I published that simply because I felt compelled to post something. Apologies to all. This post isn’t much better. This is not to say that the job has been uninteresting. I produced several pieces I really liked. Most of them required trips of eighty or more miles out of Atlanta. A Memorial Day story about a segregated “white / colored” war memorial at the Upson County courthouse was an adventure. Photog Bruce Mason and I flew by the proverbial seat of our pants to Thomaston one day. I only knew that the monument existed, and that there was an American Legion post named after the first name on the “colored” World War I monument. We careened all over town looking for folks to talk to. 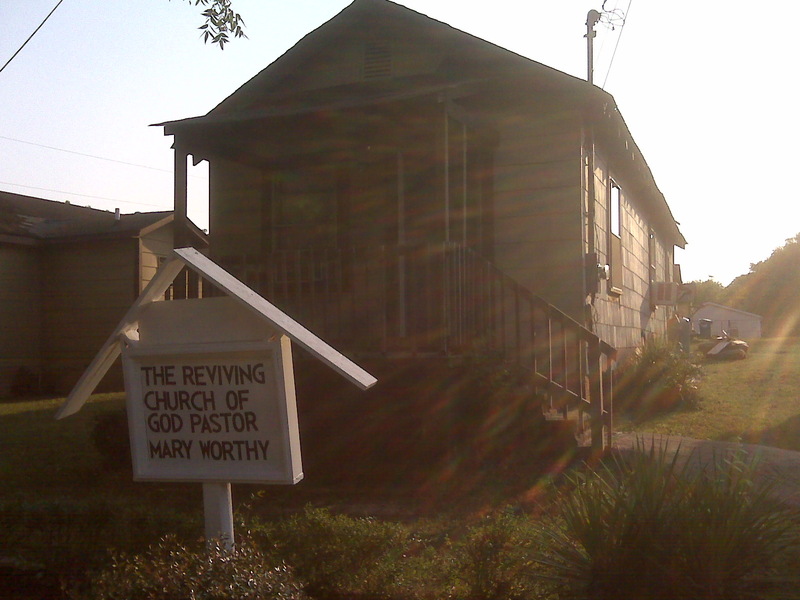 Our best decision was to lurch to a stop at a shotgun house / church that caught my eye. The pastor emerged from across the street and excitedly provided us more guidance than we deserved. I shot and edited another piece my ownself about a pro baseball player who’s a fringe prospect for the Seattle Mariners. I’ve known his parents for twenty years. Whenever I’ve talked to them about his chances of making it to the big leagues, the conversation always started with a snort of skepticism on their part. When his team visited Chattanooga, I met his mother at Lookouts stadium, got a credential and brought a camera (and a buddy, the one and only Brad Johnson, who helped me schlep gear). The story was not easy to write, because it lacked many of the usual heroic qualities expected in sports stories. But its focus on the player’s “plan B” made it unusual. Even the Suspicious Package segments began to go by the wayside a bit. There were a couple of weeks in May where I was unable / unwilling to produce one. I recouped last week. The one I wrote with producer David Ries was a hit internally, since Ries is such a deadpan, likeable, professional producer guy. Fortunately it didn’t take much to sweet-talk him into joining me on camera. He gave me none of the hand-wringing you often get from behind-the-scenes TV folk when pitching such stuff. I hope to rebound this Sunday with a piece using the mechanical gorilla at the Two Minute Car Wash on Piedmont as a prop. So, stay tuned and thanks for your patience. This entry was posted in WXIA on June 11, 2011 by live apt fire.